At the turn 2014/2015, a tectonic shift occurred. The incoming capital to China turned out to be smaller than the capital outgoing China, while the IMF admitted that China is already the largest economy in the world, when using the GDP adjusted for purchasing power parity (see the chart below). 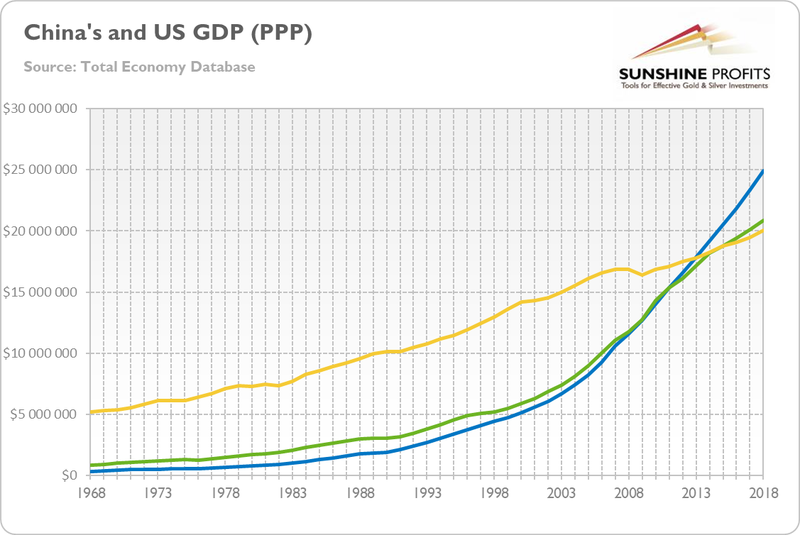 Chart 1: China’s Official Real GDP (blue line), China’s Alternative Real GDP (green line) and US Official Real GDP (yellow line) in millions of 2017 PPP US dollars from 1968 to 2018. In the face of all these successes, the Chinese leaders rejected the previous strategy of building power quietly, offering China and the world new, highly ambitious programs, such as the Belt and Road Initiative – an infrastructure program worth 1.4 billion dollars, several times more than Americans allocated to the famous Marshall Plan after the World War II. The country also set three ambitious goals to realize the Chinese Dream. First, by mid-2021, for the centenary of the Communist Party of China, the existing economic model, based on investment expansion and export, is to be replaced by a sustainable development and strong internal consumption. Second, by 2035, China will become a global leader in innovation. And, third, by the end of 2049, for the centenary of the People’s Republic of China, the country wants to achieve “great renaissance of the Chinese nation”, through a reunification with Taiwan, creating the leading civilization on the globe. These are quite ambitious plans, aren’t they? No wonder that the current global hegemon woke up. After all, the trade wars are not (only) about trade or tariffs, but (also) about dominance, hegemony and primacy in high technologies. China’s economic rise over the last 40 years thanks to the systematic adoption of structural reforms has been extraordinary. However, as the country faces many challenges, the pace of economic growth has been declining in recent years, as one can see in the chart below. 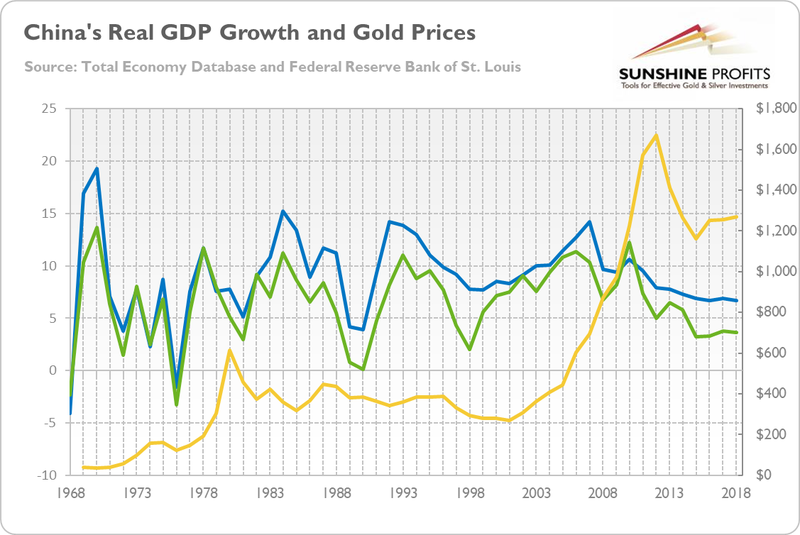 Chart 2: China’s real GDP growth (official estimates – blue line, left axis, in %; alternative estimates – green line, left axis, in %) and the gold prices (yellow line, right axis, London P.M. Fix, annual average) from 1968 to 2018. One of the biggest challenges is the transition from the export-led to a domestic-consumption-driven growth model. Given that exports account for a decent part of GDP growth, the slowdown seems to be inevitable. But the question is: will China follow in Japan’s footsteps, entering a multi-year stagnation? Possibly, but investors should remember that before Japan fell into stagnation, it had already reached high-income status in terms of GDP per capita, while China remains significantly below the threshold. What does it all imply for the gold market? Well, China has experienced tremendous progress since 1968, lifting hundreds of millions of people out of poverty. It fascinates but also terrifies. This is why some people argue that the Japanese-like stagnation is inevitable, while other prophet that China will become the next global hegemon, with US dollar replaced by Chinese yuan. And, of course, both scenarios are considered to be positive for the gold prices (either due to the global slowdown, or the demise of the greenback). However, the truth is in the middle. China will not replace the US. The Red Dragon just returned to the prominent role in the global economy that it played long time ago. We will have two- or multi-polar world, but do not expect China to dethrone US anytime in the near future, especially that America has finally adopted a more confrontational stance towards China. Sorry, gold bulls. And the country is not likely to fall into stagnation either. The slowdown is projected to be gradual (and, after all, the economic growth at 4-6 percent is still relatively fast). This is because China’s governance system – characterized by centralized policymaking and decentralized experimentation and implementation – is relatively flexible and, according to some analysts, better-suited to rapid decision-making than dysfunctional and polarized politics under democracies. Having said that, it’s clear that China will not be exempt from the iron law of regression to the mean in the long run. We are not naïve – and we do predict a slowdown in the economic growth. Actually, this is already happening. The World Bank forecast the GDP growth in China for 6.2 percent in 2019, a decline from 6.5 percent in 2018.You see, the country is going through painful structural reforms, just when the US decided to tighten its trade policy, while President Xi Jinping boosts his authoritarian rule, and the debt burden is mounting (Chinese households’ debt to GDP ratio has soared from around 18 percent in 2008 to over 50 percent in 2018). All these factors increase the risk of crisis. The boom fueled partially by debt will have to finally come to an end. When it happens, it will affect the whole globe, including the gold market. Investors should not underestimate the Chinese ability to sustain growth, but the challenges for Beijing get bigger each year. The industrial profits have recently fallen for the first time in three years, while the car sales have dropped for the first time in nearly 30 years. The simultaneous slowdown in both largest economies in the world – the US and China – would, if sharper than expected, increase the odds of an abrupt global slowdown and upset the stock markets. The yellow metal should shine, then.